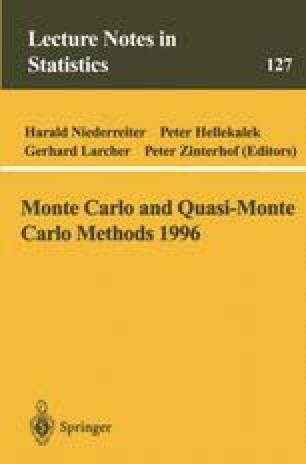 This article compares the performance of ordinary Monte Carlo and quasi Monte Carlo methods in valuing moderate-and high-dimensional options. The dimensionality of the problems arises either from the number of time steps along a single path or from the number of underlying assets. We compare ordinary Monte Carlo with and without antithetic variates against Sobol’, Faure, and Generalized Faure sequences and three constructions of a discretely sampled Brownian path. We test the standard random walk construction with all methods, a Brownian bridge construction proposed by Caflisch and Morokoff with Sobol’ points and an alternative construction based on principal components analysis also with Sobol’ points. We find that the quasi Monte Carlo methods outperform ordinary Monte Carlo; the Brownian bridge construction generally outperforms the standard construction; and the principal components construction generally outperforms the Brownian bridge construction and is more widely applicable. We interpret both the Brownian bridge and principal components constructions in terms of orthogonal expansions of Brownian motion and note an optimality property of the principal components construction.